Matthias Fink is vice head of the Institute of Innovation at the Johannes Kepler University Linz, Austria and a Professor for Innovation and Entrepreneurship at ARU Cambridge, UK. 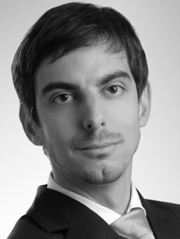 In addition he is academic director of two MBA programs at LIMAK Austrian Business School. Matthias previously worked as a Professor for International Small Business Management and Innovation at Leuphana Univerity Lüneburg Germany and was Researcher at the Institute for Small Business Management and Entrepreneurship as well as Head of the Research Institute for Liberal Professions at WU Vienna University of Economics and Business, Austria. Matthias holds a Ph.D. and a postdoctoral qualification (Habilitation) from WU Vienna University of Economics and Business and was a Visiting Professor at several universities e.g. Universitat Autònoma de Barcelona, Spain and University of Twente, The Netherlands.In research, Matthias’ focus is on the role of innovation in new venture creation and small business management. His current interests include entrepreneurship as a driver of innovation and change in regional contexts, entrepreneurial finance and ethical issues in business research. In his research designs, Matthias combines quantitative and qualitative methods. His research has been published in journals such as Journal of Business Venturing, Entrepreneurship Theory & Practice, British Journal of Management, Journal of Banking and Finance, Technological Forecasting and Social Change as well as Regional Studies. Additionally, he has published three monographs, two edited volumes and has guest edited several special issues to international journals.